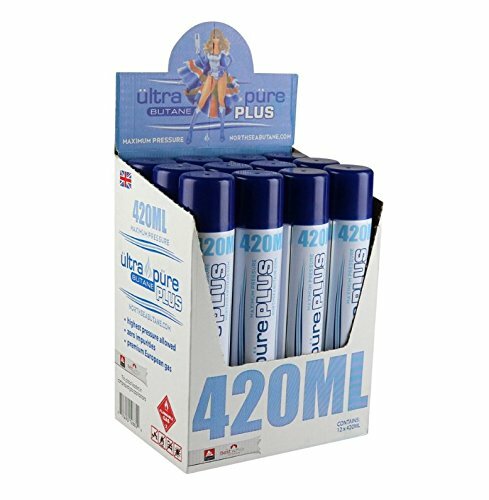 UltraPure extra purified butane lighter refill gas is the PUREST European butane in the market. 1. Do not refill your lighter immediately after using it. You should allow enough time for the lighter to cool off. 2. The flame height adjuster, usually, on the bottom of the lighter should be set to minimum. 3. ALWAYS refill the lighter in an upside down position to avoid injecting air into the lighter. 4. Press the stem of the refill can directly onto the refill valve on the bottom of the lighter. Keep them in a straight position and let the gas go into the lighter for about 5 seconds. Repeat for a shorter period if needed. 5. Allow the gas and lighter components to reach room temperature. 6. Turn the flame height adjuster to reach the desired flame height. 7. Hold the lighter away from your face and body and ignite it carefully. If there is no flame, repeat the refilling process. 8. If you experience gas leakage with a hissing sound while refilling the lighter, either you are not holding the lighter and gas can in a straight position or the stem of the gas can is not suitable for the lighter. In this case you need to use an adaptor which is usually supplied with the gas can. Before using, consult your lighter user manual. WARNING: Never fill or empty any torch or lighter over a sink (or similar well) or surface depression. Butane gas is heavier than air and may collect in low spaces, and ignite if sparked. Always refill your torch in a well ventilated room and always allow gas to stabilize for at least 3-4 minutes before attempting to ignite. If you have any questions about this product by Ultra Pure Butane, contact us by completing and submitting the form below. If you are looking for a specif part number, please include it with your message.